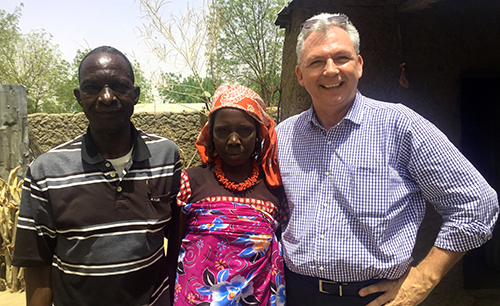 Jay Wittmeyer with Mr. and Mrs. Fafa Lawan Kapi from Chibok. As executive director of Global Mission and Service, my responsibilities include strengthening relationships with our sister churches in other parts of the world. I recently returned from a trip to be with the Nigerian Brethren as they convened their 70th Majalisa (annual conference). This conference was particularly significant for the Nigerian Brethren as they returned home after two years of displacement and exile. There have been ongoing efforts to de-Christianize the historic homeland of Ekklesiyar Yan’uwa a Nigeria (EYN), and the Brethren counted it a tremendous blessing to be present in Kwarhi. To celebrate this and to express gratitude to the Church of the Brethren for assisting EYN through their time suffering, leadership invited me to participate in the Majalisa and deliver the opening sermon. Going to Nigeria also allowed me to visit Chibok for the first time. Chibok is about an hour from Kwarhi. The paved road finishes miles before Chibok and the remaining stretch is gravel with deep potholes. Chibok is noticeably drier than many areas and extremely dry in April. The Brethren established a missionary presence in Chibok in the 1930s, started a school, and even established a Bible school. (To my amazement, I learned that the Bible school still holds classes and currently has 13 students.) 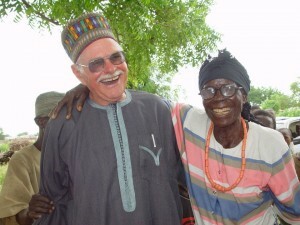 Long-term mission worker Gerald Neher wrote several books focused on his time in Chibok. The Nigerian security forces have a heavy presence in Chibok. But since I was traveling with Paul Yang, EYN district secretary, we were given permission to enter the town, visit EYN churches and the Bible school, and meet with EYN families. What had a significant impact on me in Chibok was seeing the youth brigades practice their marching. They are tasked to assist in patrolling the community and to alert the security forces of any attacks. It was inspiring to meet Laban Wadi, an EYN member who, despite the attacks, decided he and his family should stay in Chibok. They were forced to flee and spend eight nights in the bush, but otherwise have been safe living in the town while others on the outskirts had to flee. Laban retired as a medical assistant, a trade he learned from the Brethren. He expressed gratitude for my visit and asked me to bring greetings to Brethren in the United States. He mentioned Roger Schrock, Owen Shankster, and Roger Ingold, and was saddened to learn that Gerald Neher passed away last year. Laban was baptized by Gerald in 1958. Laban also reported that the last rainy season was good and he harvested 30 bags of peanuts alone. On our way back from Chibok, we stopped to see the church in Uba. When Boko Haram attacked the area in 2014, they went from town to town burning churches by the hundreds. 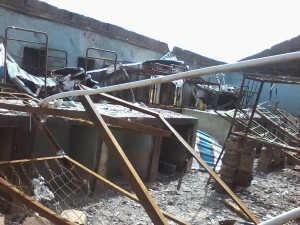 EYN lost 250 large churches, and the church at Uba was among them. The congregation is now meeting under a temporary structure as it works to raise funds to rebuild. Several thousand members attend worship every week and the footprint of the new church is very large. It will not have wooden rafters and will not be easily burned. When you give to the Church of the Brethren, you support new and ongoing partnerships around the world. Your prayers and financial contributions make it possible for relationships to grow and communities to thrive through the partnerships of Global Mission and Service. We are so thankful for your support of this important, life-changing ministry of the Church of the Brethren. Learn more about the work of Global Mission and Service at www.brethren.org/global. Support this and all of the ministries of the Church of the Brethren today at www.brethren.org/give. Chibok has always been a difficult place to get to. Here are stories of two journeys to Chibok 50 years apart. In the early 1960s the government of northern Nigeria announced a desire to transfer primary schools, both mission and native schools, to what were called Local Education Authorities (LEA). 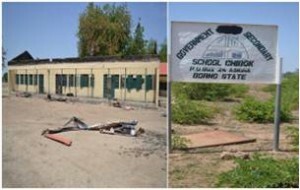 There being only a few non native schools in Borno LEA made it a good place to start. I made several trips to Maiduguri to help work out some of the details to transfer our three schools in Borno LEA – Chibok, Kaurwatikari and Mbalala. It was decided to do the transfer in 1963 and I felt the schools and teachers needed to know this as ownership and employment etc was to transfer to the LEA. Usually Chibok was cut off by road from July to October, but this was August so I decided to take a small 50cc motorcycle from Lassa for the thirty miles to Chibok. At the Musa stream I had to get men to help hoist it over our heads to cross the stream. One of the shorter men stepped in a hole and briefly disappeared below the surface. When I was within seven miles of Chibok, I came to a large flowing stream at a spot I knew to be only a low area with an occasional mud puddle. Now it flowed two hundred feet across. I had already had help several times crossing streams, so seeing no around, I parked my moped by a tree and started walking in water up to my chest. A few miles on I met some Fulani cattle herders and their dog, but we could not converse and we each went on. After separating some distance, I heard a funny sound and turned around to see their dog really bearing down on me. I reached at it and the dog veered off, but it raised the hair on my neck and added to the seriousness of the whole situation with water everywhere. As I approached the last stream just behind the mission station, I began to wonder where the station was. There was nothing but water as far as I could see. A slight movement ahead caught my eye, it was a woman climbing into the branches of a tree. I watched as she went through to the other side and down holding onto small trees as she went forward. I followed and later found that this tree grew in the middle of the stream and we had crossed the stream where it was ten feet deep and three feet beyond each bank. It was a very surprised Grace Brumbaugh who met me when I arrived at her house! They had four and a half inches of rain that afternoon and many mud houses had collapsed. It was also an appreciative group of teachers to whom I explained the upcoming changes in the running of the schools. Over the next several years we arranged for the transfer of all of our forty-two schools. Informing these teachers required less “heroism”! The road to Chibok is bad and full of uncertainty; checking points everywhere mounted by vigilante group. Bombed cars, trucks and buses abound on the road to Chibok. Burnt houses and hot. Several villages sacked by the insurgents whose inhabitants now live under trees with their children begging for aid from travelers. Abandoned Police Posts that had received the insurgents’ baptism of fire! 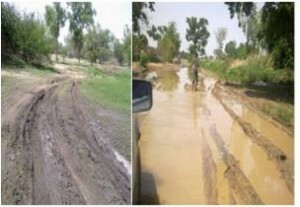 The Damboa-Chibok Road is particularly very bad. The major road has been taking over by flood. Drivers now drive through the desert forest like antelopes sneaking to avoid wet bushes from touching them. Some have been killed on the road by the insurgents and many escaped with varying degrees of gunshots injuries. Pastor Manasseh for instance, showed me injuries he escaped with on this road. At some checking points mounted by policemen and soldiers passengers are asked to step out of the car and walk through the check point. We continue to remember those abducted by the Boko Haram and pray for their safe return.